We like to start puppies into our program that are around 4-9 months old. This is a 1 month introductory course that is crucial to get your puppy on the right track to becoming an excellent bird dog. During this time your puppy will be exposed to a multitude of birds everyday to set a good foundation for pointing and retrieving. Puppies are properly introduced to gunfire, water, and different types of field cover. Response conditioning to basic commands is also done during this time. 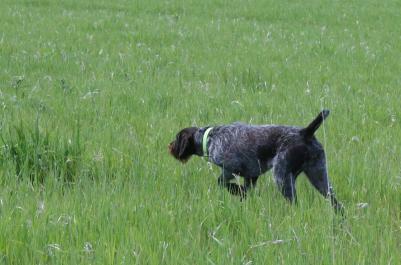 A started dog is one that can handle and quarter well in the field, point, and is steady to wing and shot. In addition, a finished dog is steady to fall, honors, and retrieves to hand. This is a program where we customize each dog's training per owner's request, which takes typically 3-5 months depending on level, specifics, and trainability of each dog. This program is available for all dog breeds. We will teach your dog basic obedience commands such as: sit, come, fetch, drop, kennel, heel, stay, come, whoa, over, and down. We will work directly with you to focus on general training or specific problem areas. We strive to improve your handling abilities while sharpening your dog's skills. Complimentary private sessions are provided with each program listed above. We feel it's extremely important that you continue to handle your dog as it's been trained, so that you and your dog work as a team. We set you up to have an ultimate hunting experience with your best bud!